This article is about geological origins and prehistoric people of Colorado. For outline of early Colorado life, see Outline of Colorado prehistory. Prehistory of Colorado provides an overview of the activities that occurred prior to Colorado's recorded history. Colorado experienced cataclysmic geological events over billions of years, which shaped the land and resulted in diverse ecosystems. The ecosystems included several ice ages, tropical oceans, and a massive volcanic eruption. Then, ancient layers of earth rose to become the Rocky Mountains. Before man, the dinosaur, mammoth, mastodon, camelops and giant bison foraged for food in a verdant land. During the Ice Age Summer humans walked into the present Colorado area as they followed and hunted large animals. The ancient hunters, the Paleo-Indians, evolved into modern Native American nations. The first people in Colorado were nomadic, following and hunting large mammals using the Clovis point. As Megafauna became extinct, people adapted by hunting smaller animals, gathering wild plants, and cultivating food, such as maize. As the natives became more sedentary, there were significant technological and social advances, including basket, pottery, and tool making and creation of permanent structures and communities. Trading with other indigenous people expanded the number and type of material items used for material goods, such as sea shells, stones for jewelry and tools, pottery and food. Precambrian metamorphic rock that forms the core of the North American continent during the Precambrian eon 4.5–1 billion years ago. There is also Precambrian sedimentary argillite, dating back to 1.7 billion years ago. During the Paleozoic, western North America lay underneath a shallow sea, which deposited many kilometers of limestone and dolomite. Lyons Sandstone was formed during the Permian period of the Paleozoic era, 250-280 million years ago. At the beginning of the period, sea levels were low and present-day Colorado was part of the super-continent Pangaea. Sand deserts covered most of the area spreading as dunes seen in the rock record, known today as the Lyons Sandstone. These dunes appear to be cross-bedded and show various fossil footprints and leaf imprints in many of the strata making up the section. :8 Related sites include: Garden of the Gods, Roxborough State Park, and the Lyons and neighboring Hall Ranch Open Space areas. Dakota Sandstone, formed during the Cretaceous period 70-100 million years ago, was deposited 100 million years ago towards Colorado’s eastern coast. It shows evidence of ferns, and dinosaur tracks. Sheets of ripple marks can be seen on some of the strata, confirming the shallow-sea environment. :14 Related sites are: Dinosaur Ridge, Garden of the Gods, Roxborough State Park, Deer Creek Canyon Park, the roadcut at the Interstate 70 Morrison exit. Fox Hills Formation was formed during the Paleogene / Cretaceous periods. It is a marginal marine yellow sandstone with shale interbeds created with the receding Western Interior Seaway in Late Cretaceous time. Laramie Formation, formed during the Cretaceous periods, is a geologic formation of the Denver Basin that ranges from 400–500 feet on the western side of the basin and 200–300 feet thick on the eastern side. The formation can be divided into a lower unnamed member containing bedded sandstone, clay, and coal and an upper unnamed member composed predominately of 90 to 190 m of drab-colored mudstone, some sandstone, and thin coal beds. Paleoclimatology is the study of prehistoric weather. The Eemian interglacial period spanned 130,000–114,000 BP. The Laurentide ice sheet covered much of Canada and the northern United States from ca. 95,000 and ca. 20,000 years before present. Sites for the early Paleo-Indian period are found on the plains (eastern half of the state), but later in the period, there are sites found in both the mountains and plains of Colorado. Other Paleo-Indian sites are Roxborough State Park Archaeological District and, with artifacts from the Goshen complex / Plainview complex, Phillips-Williams Fork Reservoir Site. The Archaic period began about 7,000 years ago. The bison antiquus had become extinct, like the other megafauna, and people became reliant on smaller game, such as deer, antelope and rabbits, and gathering wild plants. Their tool kits became larger, with greater reliance on manos and metates to grind food and changes in weapons for hunting, such as notched projectile points. They used plant fibers to make cordage, nets or traps to catch small animals and baskets to gather food. Archaic–Early Basketmaker Era (7000 - 1500 BC) was an cultural period of ancestors to the Ancient Pueblo People. They were distinguished from other Archaic people of the Southwest by their basketry which was used to gather and store food. They became reliant on wild seeds, grasses, nuts and fruit for food and changed their movement patterns and lifestyle by maximizing the edible wild food and small game within a geographical region. Manos and metates began to be used to process seeds and nuts. With the extinction of megafauna, hunters adapted their tools, using spears with smaller projectile points and then atlatl and darts. They lived in simple dwellings made of wood, brush and earth. Mount Albion complex was an early Archaic culture (about 4050 to 3050 BC), distinguished by the Mount Albion corner-notched projectile. It is the best known early Archaic culture in Colorado. :xlvii,11,488 Hungry Whistler Site, a kill and butchering site, at 11,500 feet (3,500 m) is the type site dated from about 3850 to 3060 B.C. LoDaisKa Site, Magic Mountain Site, Franktown Cave and Mount Albion are examples of the Mount Albion complex. Examples of Archaic sites are Colorado Millennial Site, Franktown Cave, LoDaisKa Site, Magic Mountain Site, Picture Canyon, Roxborough State Park Archaeological District, and Trinchera Cave Archeological District. Apishapa Phase was first identified in the Lower Apishapa canyon and is distinguished by stone or slab constructed structures, cord-wrapped pottery and small projectile points. They were a tradition of hunter gatherers who sometimes farmed and lived in northern New Mexico or southern Colorado in rockshelters, single or multi-room stone or slab structures or in campsites. :4 There are at least 68 Apishapa sites on the Chaquaqua Plateau in southeastern Colorado. :89 Some sites where Apishapa archaeological evidence has been found include Franktown Cave, Picture Canyon and Trinchera Cave Archeological District. Panhandle culture (AD 1200-1400) is a culture of the southern High Plains, primarily located in the panhandle and west central Oklahoma and the northern half of the Texas Panhandle. Most of the sites are centered around the Canadian River or its tributaries, primarily Antelope Creek and also Cottonwood Creek, Dixon Creek, Tarbox Creek and also on the Archie King Ranch. Distinguishing characteristics of the Panhandle culture are: great similarity to the Central Plains complexes; some evidence of trading or influence of Southwestern pueblo cultures; and single or multi-roomed stone structures. :87 For Colorado sites, see Trinchera Cave Archeological District as well as the Apishapa culture and Sopris Phase articles. The Early Basketmaker II Era (1500 BC - AD 50) was the first Post-Archaic cultural period of Ancient Pueblo People. The era began with the cultivation of maize in the northern American southwest, although there was not a dependence upon agriculture until about 500 BC. Rohn and Ferguson, authors of Puebloan ruins of the Southwest, state that during the Pueblo III period (AD 1150-1300) there was a significant community change. Moving in from dispersed farmsteads into community centers at pueblos canyon heads or cliff dwellings on canyon shelves. Population peaked between 1200 and 1250 to more than 20,000 in the Mesa Verde region. By 1300 Ancient Pueblo People abandoned their settlements, as the result of climate changes and food shortage, and migrated south to villages in Arizona and New Mexico, where people lived through the Pueblo IV Era and the Pueblo V Era, with the life of modern Puebloan people. After AD 1300 hunter-gathers, ancestors of the Ute and Navajo, moved into the southwestern Colorado and southeastern Utah and came to inhabit the region. The Ute arrived in Colorado by the 1600s and occupied much of the present state of Colorado. They were followed by the Comanches from the south in the 1700s, and then the Arapaho and Cheyenne from the plains who then dominated the plains of Colorado. The Cheyenne, Arapaho and Comanche were the largest group of indigenous people in Colorado at the time of contact with settlers. The Apache presence in Colorado includes the Jicarilla Apache and Dismal River cultures. The Jicarilla Apaches are one of the Athabaskan linguistic groups that migrated out of Canada, by 1525 CE, and lived in what they considered their land bounded by four sacred Rivers in northern New Mexico and southern Colorado: the Rio Grande, Pecos River, Arkansas River, and the Canadian River containing sacred mountain peaks and ranges. They also ranged out into the plains of northwestern Texas and the western portions of Oklahoma and Kansas. The Jicarilla Apache were hunter-gatherers, hunting primarily buffalo through the 17th century and thereafter added smaller game to their diet. Women gathered berries, agave, honey, onions, potatoes, nuts and seeds. Some bands practiced seasonal agriculture along the upper Arkansas River, cultivating squash, beans, pumpkins, melons, peas, wheat, and corn. It unclear how and when the Arapaho entered the Great Plains, they most likely lived in Minnesota and North Dakota before entering the Plains. Before European expansion into the area, the Arapahos were living on the plains in South Dakota, Nebraska, Colorado, Wyoming, and Kansas. They were close allies of the Cheyenne people. In winter the tribe split up into camps sheltered in the foothills of the Rocky Mountains in present-day Colorado. In late spring they moved out onto the Plains into large camps to hunt buffalo gathering for the birthing season. In mid-summer Arapahos traveled into the Parks region of Colorado to hunt mountain herds, returning onto the Plains in late summer to autumn for ceremonies and for collective hunts of herds gathering for the rutting season. The Cheyenne arrived in the Colorado area shortly after the Arapaho, spoke both of the Algonquian languages, lived on the plains east of the Rocky Mountains with the Arapaho. The Cheyenne and Arapaho banded together against the Comanche, Kiowa, Shoshone and Ute. The ancestors to the Navajo were one of the tribes of the southern division of the Athabaskan language family that migrated south from Alaska and northwestern Canada, most likely traveling through the Great Basin. The Navajo ancestors were in the area after AD 1300, but at least by the early 1500s. The Pawnee ranged through the Great Plains and were first documented by Francisco Vásquez de Coronado when he met a Pawnee chief from Nebraska in 1541. Regarding Colorado, they hunted bison on plains of eastern Colorado. Ute hunter-gatherer ancestors migrated east from California in about the 12th century and before the 17th century migrated from Utah and the Great Basin to occupy most of Colorado. They were prehistoric hunters of western Colorado and ranged east to the Great Plains and in canyons and mountains of eastern Utah and Colorado. The Ute are the only Native American group with reservations in Colorado. ^ Gadd, Ben (2008). "Geology of the Rocky Mountains and Columbias" (PDF). Retrieved 2010-01-01. ^ a b c d e f g h i j k l m n o Johnson, Kirk R.; Raynolds, Robert G. (2006) Ancient Denvers: Scenes from the Past 300 Million Years of the Colorado Front Range. Fulcrum Publishing for Denver Museum of Nature and Science ISBN 1-55591-554-X. ^ Lexicon of Canadian Geologic Units. "Fox Hills Formation". Retrieved 2010-02-01. ^ Eldridge, G.H., 1888, On some stratigraphical and structural features of the country about Denver, Colorado: Colorado. Scientific Society Proceedings, v. 3, pt. 1, p. 86 118. ^ Shroba, R.R., and Carrara, P.E., 1996, Surficial geologic map of the Rocky Flats environmental technology site and vicinity, Jefferson and Boulder Counties, Colorado: U.S. Geological Survey Miscellaneous Investigations Series Map, I 2526. ^ King, C. 1876. Report of the Geological Exploration of the Fortieth Parallel. U.S.Geographical and Geological Survey. ^ a b Kruger, Fraces Alley; Meaney, Carron A. (1995). Explore Colorado: A Naturalist's Notebok. Photography by John Fielder. Englewood, Colorado: Westcliff Publishers and Denver Museum of Natural History. 1-56579-124-X. ^ a b c Waldman, Carl. (2009) . Atlas of the North American. New York:Facts on File. ISBN 978-0-8160-6858-6. ^ Stiger, Mark. (2001). Hunter-Gatherer Archaeology of the Colorado High Country. University Press of Colorado. p. 169. ISBN 978-0-87081-910-0. ^ a b c d e f g h i j k Cassells, E. Steve. (1997). The Archeology of Colorado, Revised Edition. Boulder, Colorado: Johnson Books. pp. 53-54. ISBN 1-55566-193-9. ^ a b Griffin-Pierce, Trudy. (2010). The Columbia Guide to American Indians of the Southwest. New York: Columbia University Press. p. 130 ISBN 978-0-231-12790-5. ^ a b c d e Gunnerson, James H. (1987). Archaeology of the High Plains. Denver: United States Forest Service. ^ Archaic: 5500 to 500 B.C.- Overview. Crow Canyon Archaeological Center. 2011. Retrieved 10-18-2011. ^ Time-Life Book Editors. (1993)  The First Americans. Alexandria, Virginia: Time-Life Books. pp. 29, 30. ISBN 0-8094-9400-0. ^ Archaic-Early Basketmaker Period. Chaco Culture National Historical Park, National Park Service. Retrieved 10-15-2011. ^ Archaic: 5500 to 500 B.C. - Housing Crow Canyon Archaeological Center. Peoples of the Mesa Verde Region. 2011. Retrieved 10-17-2011. ^ a b c Gibbon, Guy E., and Kenneth M. Ames. Archaeology of Prehistoric Native America: An Encyclopedia. New York: Taylor and Francis, 1998. ISBN 0-8153-0725-X. ^ a b Gunnerson, James H. Archaeology of the High Plains. Denver: United States Forest Service, 1987. p. 28. ^ Gunnerson, James H. Archaeology of the High Plains. Denver: United States Forest Service, 1987. p. 28-29. ^ The Dismal River Culture.. Nebraska Studies. Retrieved November 26, 2011. ^ Ancestral Pueblo - Basketmaker II. Anthropology Laboratories of Northern University of Arizona. Retrieved 10-14-2011. ^ a b c d e Wenger, Gilbert R. (1991) . The Story of Mesa Verde National Park. Mesa Verde Museum Association, Mesa Verde National Park, Colorado. ISBN 0-937062-15-4. ^ Stuart, David E.; Moczygemba-McKinsey, Susan B. (2000) Anasazi America: Seventeen Centuries on the Road from Center Place. University of New Mexico Press. pp. 56-57. ISBN 0-8263-2179-8. ^ Pueblo Indian History. Archived 2011-10-08 at the Wayback Machine Crow Canyon Archaeological Center. Retrieved 10-9-2011. ^ Lancaster, James A.; Pinkley, Jean M. Excavation at Site 16 of three Pueblo II Mesa-Top Ruins. Archeological Excavations in Mesa Verde National Park, Colorado. National Park Service. May 19, 2008. Retrieved 10-9-2011. ^ a b Pueblo III - Overview. Crow Canyon Archaeological Center. 2011. Retrieved 9-27-2011. ^ a b c The Post-Pueblo Period: A.D. 1300 to Late 1700s. Crow Canyon Archaeological Center. 2011. Retrieved 9-26-2011. ^ a b c d e Indians of Colorado. The William E. Hewitt Institute for History and Social Science Education. University of Northern Colorado. Retrieved December 7, 2011. ^ "Spanish Relations with the Apache Nations east of the Rio Grande", Jeffrey D. Carlisle, B.S., M.A., University of North Texas, May 2001, pages 3, 45-46. ^ "Spanish Relations with the Apache Nations east of the Rio Grande", Jeffrey D. Carlisle, B.S., M.A., University of North Texas, May 2001, pages 4-5. ^ Velarde Tiller, Veronica E. (2011) Culture and Customs of the Apache Indians. Santa Barbara, CA: Greenwood of ABC-CLIO. p. 28. ISBN 978-0-313-36452-5. ^ Pritzker, Barry M. (2000). A Native American Encyclopedia: History, Culture, and Peoples. Oxford: Oxford University Press. pp. 12-14. ISBN 978-0-19-513877-1. ^ Greenwald, Emily. (2002). 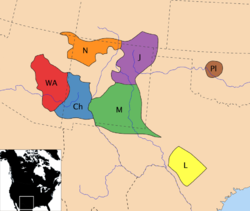 Reconfiguring the reservation: The Nez Perces, Jicarilla Apache and the Dawes Act. University of New Mexico Press. p. 97. ISBN 0-8263-2408-8. ^ Center for Colorado authors. (April 2, 2010). Colorado Native American Studies Resource Guide. Center for Colorado, Auraria Library. Retrieved December 7, 2011. ^ "Spanish Relations with the Apache Nations east of the Rio Grande", Jeffrey D. Carlisle, B.S., M.A., University of North Texas. May 2001. pp. 3, 47. ^ What Other Indian Tribe is Related to the Navajo? Crow Canyon Archaeological Center. 2011. Retrieved 9-26-2011. ^ The Ute–Southern Paiute Connection. Crow Canyon Archaeological Center. 2011. Retrieved 9-26-2011. This page was last edited on 1 September 2018, at 11:08 (UTC).